Born in France, the 39-year-old Romain moved to Tokyo in 2003 to work as co-director and art director on a French-Japanese anime series called Oban Star-racers. Savin was able to secure funding from European partners, and when the two showed up in Japan, they brought several million euros to make their show with a Japanese studio. After the production ended, Romain decided to stay in Japan. After that, Romain went on to create the concept for Basquash!, as well as work as Art Director, Mechanical Concept Design, and Key Animation on the show. 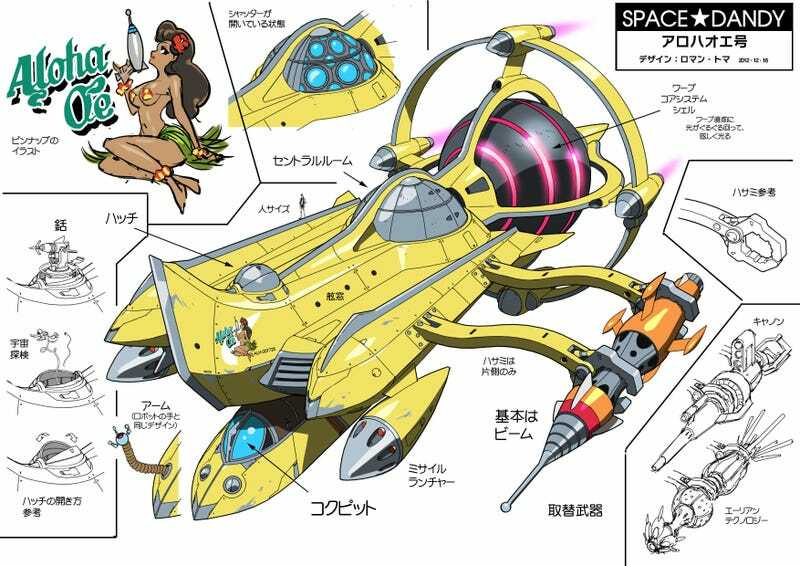 He also did art direction for Senki Zessho Symphogear, spaceship design for Space Dandy, and worked as the Supervising Director on Cannon Busters. In his free time, Romain has also been creating art with his children. Those years of experience might be why Romain is one of the best people to ask about working in the anime business. I sent him a list of questions about how to get into the field. What’s your advice for people who want to work in anime in Japan? “The first advice I usually give to people is: learn Japanese. Unfortunately finding Japanese production staff who can understand English is very rare. You won’t be hired if you cannot communicate with them, so if you want to go live in Japan, YOU need to make the effort of learning the language. Second piece of advice is that the sooner you start, the better. Japanese studios prefer to hire young and inexperienced people. You don’t need to have a master’s degree in animation; a couple of years of basic artistic training is enough to start as junior animator. But the consequence is that the pay is very low. It’s better to consider this period as a long internship during which you will be taught by a senpai while working on ongoing productions. It’s good to be aware that drawing skills are not required to work in this industry. You can work as a production assistant, editor, or compositing artist for example. None of these jobs require knowing how to draw, even if you want to become a director. Lots of anime directors started as production assistants and never went to art schools. How did you apply and interview for a job? What surprised you about making anime in Japan? “I was surprised by how humble all the anime staff in the studio were, and how terrible their living conditions were, compared to the situation in the animation industry in the West. In a nutshell, the money don’t flow back to the animators (and other workers)—they are poor. Most of them spend most of their lives sat at their desks and are single because they have either not enough time or not enough money to build a family. Some of them are also extremely shy, like they cannot even answer you when you say hello. It can be disturbing at first. But people are very friendly and intrigued to have foreigners amongst them willing to live a similar life. Most of them don’t understand why we want to work in anime because they are aware that it is a very difficult job with low pay and lot of (unpaid) overtime. For us, anime is exciting because it’s exotic, but for them it’s just work as usual. I do not think they can truly understand our feeling as foreigners working in Japan unless they have experienced the fact of living outside of Japan themselves, or even travel abroad from time to time, which most of them never did because they cannot afford it. I was also surprised to realize that all the Japanese animators weren’t geniuses. You know, because only masterpieces like Ghibli movies or series like Cowboy Bebop were released in France before I went to Japan, I thought that every Japanese animator could draw like a god. I was wrong. There are animation gods like Toshiyuki Inoue, but there are also lots of low-level animators who can only survive in this industry because too many shows are produced and studios that are desperately looking for staff have no other choice but to offer them jobs. “My experience wasn’t that bad, actually—otherwise I would have gone back to France. After being employed by the French company that was producing Oban Star-racers, the Japanese animation studio Satelight hired me as art director. At this level usually it’s not a problem to make a living out of it. You just have to manage the large quantity of work by being efficient enough and not being a perfectionist. What’s the most difficult thing about working in the anime industry? “Definitely the large quantity of work to deal with in a short time period. I was surprised by how short the production schedules are and how scarce the teams are due to the shortage of artists. Studios are open 24/7, and people are also working on the holidays most of the time. You get emails during the night. It’s totally normal to have meetings during the night or the weekends. You really have to be ready to work hard, to reach the same level of commitment as your Japanese co-worker, otherwise the risk is that they may not accept you as one of them. What industry horror stories have you heard? “It’s not only that I’ve heard horror stories, I’ve seen them. Basically, most of the people are overworked. The problem is that in the traditional Japanese way to behave in society, people tend to say yes when they are asked to work under impossible conditions. For the sake of the studio and the project team, they will do the impossible, even stay several days at the studio in a row, and therefore put their own health at risk. I’ve seen people going home only once per week, or working 35 hours in a row. I’ve even met an animation director who was going home only once per year to their parents—she wasn’t renting an apartment. She was living at the studio, using the public bath and manga cafes to rest a little bit from time to time. A married couple, a director and his wife character designer, were camping in a corner of the studio, sleeping in sleeping bags until the production was finished. Some people also don’t allow themselves to take a break even if they are sick, because they don’t want to spend their small wage on health care. Life expectancy amongst animators isn’t very old. I’ve seen people passing out at work. The worst has been people dying from karoshi (death by overwork). One of my colleagues died from a stroke 10 years ago while he was working in a different studio (staff working for several companies at a time is rather common). Another one barely recovered from a severe stroke as well. Recently I’ve heard of the death of an animator working on a pretty famous show in another studio, but everybody kept it secret, probably not to damage the company. What’s the least difficult thing about making anime In Japan? “Being surrounded by talented and dedicated animators and directors is very motivating. I don’t feel alone at the studio. I’m currently writing this answer at 12:30 pm on a Friday night and there are plenty of staff members working around me. What are traits of those who find success In anime? “Well, the first important trait to have is dedication or, I would say, perseverance. You can’t just come in and find success right away. It takes months, years. Gaining the trust of the Japanese team is the key. The most valuable quality you can have, from a manager’s point of view, is respect for the schedule. If you manage to complete your tasks in time, with a certain level of quality, you’ll be able to quickly step up. The second thing is the ability to merge into the production team, from a Japanese point of view. Understand the concepts of tatemae and honne, learn how to talk to your colleagues with the proper language. Deciphering the cultural codes and habits is important if you want to be accepted and thus be rewarded with interesting jobs. That’s something you cannot learn in books. You have to be there and be very attentive to your surroundings. Has working in Japan changed you? Do you have any advice for improving as an artist? “Well, it all depends of the definition of artist you choose. If artist means a creative person who follows his own path by finding his (her) own style, message, and can influence other people all around, I do not have any good piece of advice to give. I assume vision, perseverance and communication are the keys. But if by artist you mean a professional in a creative industry who can make a living out of his “art,” there are obviously a few reasonable pieces of advice I can give. I would recommend building strong academic skills rather than developing a particular style. This way you will be able to adapt to different production needs and styles all along your career. Be ambitious but don’t be too impatient. There are presumably already more experienced and talented people here in the industry who deserve access to important positions more than yourself, for now. Respect them, learn from them and wait for your turn, because it will eventually come. Be ready for that moment. Don’t rush it at all costs. This is not a sports competition; hopefully you’ll still be active at 50 or 60 years old. That’s a lesson I learned in Japan. Make a lot of friends in the industry—you will probably learn as much from them as from your elders. Share their successes and failures, grow with them, develop a true team spirit. They will help you when you need it, and you will definitely need it at one time or another. Share your techniques and experience with younger artists. It will help them grow, and you will gain their respect at the same time. Everybody will benefit from this.